SKY FORCE by Infinite Dreams IS OUT! Discussion in 'Android Apps & Games' started by MikeID, Dec 17, 2009. 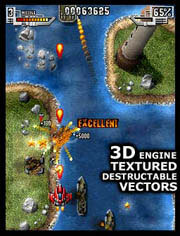 SKY FORCE - the ultimate arcade shooter is now available on Android! You can get your own copy of the game by visiting the store. We will try to keep this topic updated so stay tuned for more info, screenshots and vodeos! Awesome! but is their a Lite version for people to try? Can't find it on the market thru that QR code. Is there a lite? This game is really good! A little choppy at times, but very good overall! Buy the game, if you do not like it, just uninstall and refund for it, up to a day! So, it's a touchscreen bullethell game? good game but not at droid resolution as said. Also only 5 lvls i think. Need more! I tried it on my iPod touch (1st gen) and it was good, I'd be interested to see how good it runs on the Hero. Just wanted to let you know that Sky Force and Sky Force Lite have just been updated. It is now optimized for Droid and Nexus One. It also works fine on older devices. Check it out! Quick mini-review of Sky Force Lite on the HTC Desire (similar to Nexus One). 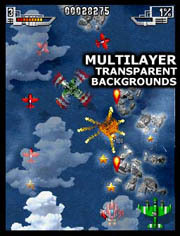 - Vertical shooter/scroller implemented very well. - Graphics are generally good - colourful, interesting, clear. - Responsive, logical input (I used touch mode). - The graphics are quite blocky as there's no anti-aliasing. - It doesn't appear to handle Android system stuff very well. E.g. back button kills game completely, no resume or anything like that. - Sound is low quality. - Fun. I might buy, although there doesn't look like there's a whole lot of content in the full version. Better handling of Android system stuff like the back button, resuming a paused game, would be very welcome! A good game and a very promising entry into Android development. Thanks for your thoughts about the game! Please let me add a few comments. "The graphics are quite blocky as there's no anti-aliasing." This is done on purpose, it's a design decision. We want the game to remind old-school classic shooters where pixels actually were blocky. A smoothing filter could be easily applied, but for now we've decided that it looks great without it. Could you please let me know what do you mean by that? It's an old school arcade sound. The complete soundrack takes about 3 minutes, we got a lot of positive comments about it in the past. Have you noticed any odd behaviour? Perhaps it's a problem with HTC Legend that we should look into? "It doesn't appear to handle Android system stuff very well. E.g. back button kills game completely, no resume or anything like that." Yes I have to agree with that. This game is multiplatform and it was originally designed for other platforms. The problem is that we can't save the game state at any given time. However, once you've completed the stage it will be saved and you would be able to resume it from the beginning of this stage. Any other suggestions about how we could improve it (other than saving the game state when user hits BACK button)? "Fun. I might buy, although there doesn't look like there's a whole lot of content in the full version." Lite version has just one stage, full version has 8 stages. Thats 8 times more content! Anyway, I really appreciate your feedback. We will be making our game better in next updates! The sound problem is that it is like an 8-bit arcade - I understand the nostalgic aspect of it but, perhaps because I didn't play arcade games or own an early console or gameboy, I don't really get the charm. Perhaps it's the same for the graphics. There's no bugs with either on my device (Desire, not Legend fwiw). The sound doesn't bother me anyway (I generally turn sound off as I might be playing on the bus or other public places), graphically I'd prefer smoother looking art, more iPhone than Gameboy, but that's a personal preference and I respect your creative decision. More content is always welcome - perhaps an endless mode with a randomly generated map where you just fight until you run out of lives, all for a high-score? Saving the state is even more important if you add this as I'd hate to be nearly at a record score just to lose it all because I get a phone call! I remember buying this on my old Nokia 6330, it was great back then, I'm sure you'll get a lot of sales out of this version too. Personally I'm not sure I'll go for it this time around, sound is spot on, and I have to agree the graphics seem a little too stretched, but they're perfectly fine, I've played much smaller resolution games on much bigger screens. The main problem for me is not the game at all but the control interface, I'm not sure I like using the screen to move around, the controls do work fine but it's personal choice I guess and again not much the developer can do about it considering how technology has "moved on". I loved Sky Force on my N73, it was a great game that you guys delivered on S60v3 back in the days, with this and K-Rally you still hold the crown for best graphics over there. But honestly, you shouldn't have ported it like this, it was great on it's original plattform, but on Android it really looks dated and doesn't do your usual quality justice. From Idreams I expect Touchscreen Controls that rival Espgaluda II on Iphone or Trackball controls, I see you as a premium development team and don't want to discourage you from porting to Android, because I'm happy you develop for my favorite plattform, but please update it and show all Android gamers how good you really are. Loved it on Symbian and I love it on Android. What a great game. People should give the lite version a go. Just wanted to comment some of your posts. 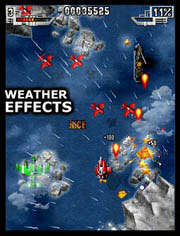 Sky Force is an old game but we've improved it a lot over the years and there is still a high demand for it. Even on iPhone, where competition is really tough, we've sold a lot of copies and got many satisfied customers. Porting it to Android was not an easy task. To make it run as smooth as it works right now in such a fragmented environment was really a big task. Still, I see it as one of the most polished shooter for Android. I belive it was worth the effort! We'll definitely be bringing more titles to Android. At first, it will be high quality ports, but over the time we'll try to bring more innovation. Stay tuned, and I hope you are enjoying Sky Force. I'll agree, it is the best shooter I've tried so far on Android. Just wanted to let you know that Sky Force is updated now. Version 1.28 added trackball and DPAD controls! Now you can control the ship using: touch, accelerometer, trackball or DPAD. chaz_uk and Dan Fury like this. After the update the ship turning no longer with a 3D effect when I steer. Why not? Thank you Marek, that's what I'm talking about, I knew you guys could deliver. Playing it with trackball is great and definately my preferred control scheme for shmups. The only thing, that could be improved (which is totally unneccesary now, but you are so close to have the perfect control layout, that I want to mention it) is the touch controls, at the moment the ship flies where I touch, so I always block the view, it would be nice if it were like in Espgaluda II or Walpurgis on Android, so I can touch anywhere and control the ship without blocking the view. Also, it would be really nice if the game would pause, if I multitask. I sometimes hit the home key, when I play with trackball and fly forward and then I have to start over again. Just uploaded version 1.29. Back button will not quit from gameplay right now. It will quit from game only if you are in the menu. I think this is an optimal solution. Also, 3d ship animation is back now. Thanks for Wingnut for spotting this one. To Dan Fury. Thanks for recommending those 2 shooters. I've tried them both and I'll definitely consider this kind of touch control in next updates!